There is no true healing, unless there is a change in outlook, peace of mind and inner happiness. Safe and natural - Can be used even for children, babies, animals and plants. Simple - Everyone can learn how to use them. Complementary - Can be used alongside with other treatments, medicines or healing practices. ​​﻿﻿﻿There are 38 remedies in the Bach Flower Remedies system. All of them were discovered in the 1920s and 1930s by Dr Edward Bach, a well-known bacteriologist, physician and pathologist, and have been successfully and widely used in many countries over 70 years. Dr Bach in his medical career life, realized that physical health is closely linked to emotional health. To cure a physical ailment, resolving the emotional issues is of utmost importance. By 1930 he was so enthused by the direction his work was taking that he gave up his lucrative Harley Street practice and left London, determined to devote the rest of his life to the new system of medicine that he was sure could be found in nature. The pressure of financial instability and the threat from British Medical Association to withdraw his medical practice licence did not dampen his convictions. Eventually, Dr Bach succeeded in his quest to discover 38 remedies from the nature that could help resolve any emotional imbalances. Each remedy is associated with a basic human emotion. Mimulus, for example, is the remedy for when we are feeling anxious, nervous or afraid about something. Taking Mimulus will help us overcome our fear and face life with courage. ​With the 39 remedies (38 plus the emergency combination remedy*, which is usually thought of as a separate remedy), there are nearly 293 million available combinations. There is no personality, emotional states or moods that cannot be addressed by the remedies. This complete system is timeless, applicable for all times. Each of the 38 remedies discovered by Dr Bach is directed at a particular characteristic or emotional state. Any of the emotion states could exist concurrently at any one time in a person, which would result in different manifestation of personalities and emotions. To select the remedies you need, think about the sort of person you are and the way you are feeling. For new users to fully understand each of the 38 emotion states and to accurately identify which are the ones that describe your current emotion states, it is still highly recommended to consult an authorized Bach Foundation Registered Practitioner to help you select the appropriate remedies. ​Dr Bach designed his system to be simple, so that everyone can self-help using the Bach Flower Remedies to have better awareness of their own emotional states and to practise self-healing. It may seem daunting at first, but anybody can learn how to use it. Dr Bach's philosophy of simplicity underpins that healing on an emotional level leads to a healthy emotional life and a balanced personality that will allow your body to find its own natural state of health. Bach Flower Remedies are 'medicines' for the emotions that aim to balance negative states of mind and resolve character defects by encouraging the corresponding virtue. The remedies re-energise the positive emotions, and do not put qualities into us that were not there before. Instead, they encourage and enhance the positive emotions that were already in us, so that they become strong enough to drive out the negative feelings that were dragging us out of balance. ​Out of the 38 remedies, only 1 remedy is made using natural spring water. The rest are made using flowers of plants or trees with healing properties. During the right seasons, the blooming flowers are plucked into a glass bowl of water and placed under the hot sun to draw out the healing energy of the flowers. This is the world-famous 'The Sun Method' discovered by Dr Bach. Woodier plants, and those that bloom when the sun is weak, are prepared by 'The Boiling Method' i.e. boiling the flowering parts of the plant for half an hour in pure water. In both cases, once heat has transferred the healing energy in the flowers to the water, the energized water is mixed with an equal quantity of brandy. This mix is the mother tincture. 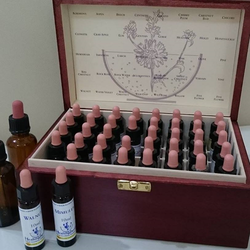 With the all-natural way of preparing the remedies, it is no surprise that the Bach Flower Remedies have been in-use worldwide over 70 years without any adverse or side effects. Using Bach Flower Remedies, is indeed, the safest and gentlest complementary way of healing.